The Smart Tails Standard Thinning Rake from Smart Grooming is a revolutionary tail and mane rake which thins and gives the pulled look without discomfort. Within minutes a full tail can be transformed to a pulled tail which is ready for the show ring. 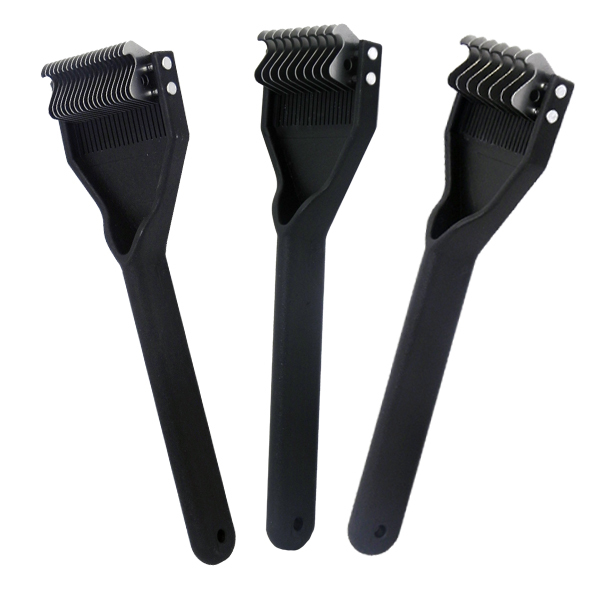 Great even on sensitive animals, it is made from high quality steel with a plastic handle. It is a disposable rake which tidies 10 - 20 tails, depending on how much needs to be done each time. Can also be used on dogs and other small animals to thin and de-matt thick hair. Fine blades - mostly used on hair which have already been tidied or is quite fine. It is also useful to finish really thick tails when a show or close finish is needed, and the bulk of it has already been shaped with a coarser blade. Medium blades - good for the average type of mane, tail or coat. This will cope with medium to soft hair and is ideal on manes and tails. Coarse blades - good for thick full tails, manes and think coats, which haven't been tidied before or are very coarse. This will process a large amount of thick hair easily and efficiently leaving a tidy looking finish. The coarse is also very good on natives that are being shown, and the end result needs to look tidy but still untouched. There are currently no questions for Smart Grooming Smart Tails Standard Horse Thinning Rake - be the first to ask one!